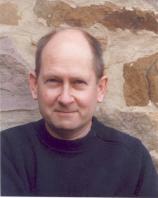 Stephen Baxter, an award-winning sci-fi author, has created the last of the five-book series written in collaboration with Sir Terry Pratchett. It tells of the lifelong journey of Joshua Valienté that began in Madison, Wisconsin in THE LONG EARTH. The reclusive and brainy youth was tinkering around in his room at the orphanage where he was raised when he invented a simple device that allowed one to “step” into a parallel universe. So simple that anyone could build it, the instructions appeared on the Internet, and the Stepper led to sometimes disastrous and often funny events. The experience became the new rage and led to people stepping in and out of Madison and beyond. “Step Day” became a significant date in history, and Joshua became an international hero as this simple device led to a survival tactic that helped humans (and *Trolls) survive over six decades of cataclysmic events. "THE LONG COSMOS is perhaps best enjoyed by those who have read the first four titles. All are exciting and entertaining on their own, but collectively they are essential in grasping this concluding volume." THE LONG COSMOS is a final tribute to the collaboration between Baxter and Pratchett, the latter of whom died of Alzheimer’s disease at the age of 66 in 2015. The idea for these novels originated after the two met at a book signing event in 1992. They each became a fan of the other’s work, and years later began brainstorming a book concept after Pratchett recalled a sci-fi manuscript he had laid aside after the Discworld series took off. In it, a parallel universe became reachable by use of a simple gadget, and the idea was born. Together they developed a storyline that ultimately would lead to five novels. Each follows Joshua’s wildly imaginative and often amusing life-altering journey as the accidental time traveler who saves the human race. When a cataclysmic volcanic eruption in Yellowstone Park in THE LONG WAR nearly wipes out most of North America and Europe, and a manmade disaster by a mentally ill man detonates a nuclear suicide vest in downtown Madison, the only escape route is to “step” back to better times --- as far back as the Ice Age and even Mars. The big step in THE LONG COSMOS finds Joshua and his fellow adventurers following a call of “JOIN US,” which sends out an invitation to adventurers from an Earth inhabited by humans vastly changed in 2070 through cybertechnology. Baxter recaps much of what occurred in the prior novels, which reflect Pratchett’s style, whereas this fifth installment, while adhering to the earlier books, is stronger on the science fiction components and technological aspects of the sci-fi literature that is Baxter’s milieu. 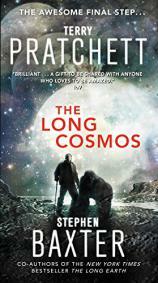 THE LONG COSMOS is perhaps best enjoyed by those who have read the first four titles. All are exciting and entertaining on their own, but collectively they are essential in grasping this concluding volume. Is it ironic that each of these books --- THE LONG EARTH, THE LONG WAR, THE LONG MARS, THE LONG UTOPIA and THE LONG COSMOS --- carries the adjective “long” in their titles? Alzheimer’s disease, which prematurely took Pratchett’s brilliant mind and his life, is commonly known as “the long goodbye.” As fans bid that long, sad goodbye to the genius that was Terry Pratchett, may we hope wistfully that someone will unearth a Discworld manuscript long forgotten in some dusty attic or desk drawer? Perhaps a redux of NIGHT WATCH or another visit from Hogfather?